What is Divorce Busting® ? Ann was thoroughly convinced that her marriage of fifteen years was over. She believed she tried everything humanly possible to straighten things out between her and Steve. Nothing ever worked. The more she tried reasoning with him, the more unreasonable he became. Appealing to his sensitivity brought out only his insensitivity. Years ago when their problems began, Ann thought, " This is just a stage we're going through." But, now she knew she was just fooling herself. She sadly admitted that their marriage had gotten progressively worse, not better. As she reminisced about the past, she recalled nostalgically that, despite their difficulties, they occasionally shared good times. Recently, the constant war at home served as a painful reminder that much of what they had together appeared to be lost forever. To make matters worse, their battles had not gone unnoticed by their three children. Bedtimes had become fraught with tears, questions about divorce, unusual nighttime fears and anger. Desperate for some answers, Ann reflected on what went wrong. Though things were never perfect, Ann thought the birth of Melissa, their oldest child, marked a turning point in their marriage. Initially, both Steve and Ann were ecstatic about their new baby, but their mutual joy was short- lived. Ann became totally immersed in motherhood as Steve spent increasing amounts of time with his buddies participating in whatever sport happened to be in season. At first, Ann frequently expressed her hurt and resentment about his long absences, but since Steve seemed unresponsive, she stopped trying. Now, five years later, Ann and Steve appear more like roommates; separate bedrooms, few shared activities and, when not fighting, verbal exchanges limited to "Pass the salt." After watching a talk show about women who feel lonely and alienated within their marriages, Ann saw a reflection in a mirror; she suspected that the camera crew secretly moved in and candidly filmed the story of their lives. She finally realized that struggles with Steve had reached life and death proportions. Simply, if she stayed unhappily married to Steve, she would die a slow and torturous death; if she divorced, she might live. Ann's story is all too familiar. During the past ten years that I have worked with couples who have marital problems, I have heard many stories like Ann's. The scenes and the actors change, the specifics vary, but the dynamics are strikingly similar. When problem solving efforts prove ineffective, divorce seems like the only solution. Early in my career, Ann's pessimism would have convinced me that her marriage was irreparable and that it was time for her to take care of her needs. "The handwriting is on the wall," I would have conjectured, "You certainly have tried everything." I would have furnished her with further evidence that, regardless of what she might do, Steve was unlikely to change. Encouragement to "let go of the past" and look toward a brighter future without the arguments would have been my next recommendation. We would have rehearsed how she might break the news to her children. After she wiped her tears, I might have suggested, "Perhaps you should join a support group for divorced and separated people to help you through the transition." And as she left my office I would have handed her a long reading list to guide her through the process. But those days are gone. Now, I do whatever I can to help people find solutions to their marital problems so that they can stay together. I do not get sidetracked by pessimism and hopelessness as I did in days past. Now I know that hopelessness is a reasonable response to an unreasonable situation. Nothing more, nothing less. It is natural for people to feel pessimistic when, day after day, month after month, nothing improves, problems never get resolved. Feelings of pain and rejection are ever-present. How can people envision their marriages improving when their track record hasn't been so good? Believing that there's still some solution that might work requires a leap of faith. Now I am convinced that pessimism and hopelessness are feelings based on past performances; feelings that are changeable, feelings worth changing. People can and should stay together and work out their differences. Why the switch? There are many reasons. Over the past several years I have witnessed the suffering and disillusionment that are the predictable by-products of divorce. I have seen people who have been divorced for five years or longer with wounds that won't heal. These people failed to anticipate the pain and upheaval divorce leaves in its wake. I have heard countless divorced couples battle tenaciously over the very same issues they believed they were leaving behind when they walked out the door. They learned too late that the act of divorce does not free them from their ex-spouses' emotional grip; some ghosts live forever. I have heard too many disillusioned individuals express regrets about their belief that their ex-spouse was the problem only to discover similar problems in their second marriages or, even more surprisingly, in their new single lives. They admit to recreating the same unproductive patterns of interacting in new relationships, repeating old mistakes or discovering that they are still miserable. Diagnosing one's spouse as the source of the problem, a common antecedent to divorce, doesn't take into account the roles both partners play in the deterioration of the relationship. The habits spouses developed over the years go with them when they walk out the door. This may partly account for the saddening statistic that 60% of second marriages also end in divorce. And then there are the children, the real victims in divorce. Research shows that, except in extreme cases of abuse, children want their parents together. Children have no say in a decision that profoundly affects them for the rest of their lives. When parents decide to end their marriage, it means the death of the family. As the family disintegrates, a child's sense of comfort and security becomes shaken. Carl Whitaker, a leader in the field of family therapy, once said, "When children are involved, there is no such thing as divorce." Battles over parenting issues don't end with divorce, they get played out even more vigorously with children as the innocent bystanders. Uncomfortable gatherings at future family weddings, bar mitzvahs, graduations, births and funerals provide never-ending reminders that divorce is forever. I've met children of all ages who, even after both parents remarry, secretly hope their own parents will, someday reunite. Many well-adjusted adults whose parents separated or divorced when they were children admit an emptiness that never goes away. Most parents recognize that divorce will impact on their children, they just don't anticipate the lasting effects. In regards to this, I've heard too many divorced parents say, "I wish I knew then what I know now." Gradually, I have come to the conclusion that divorce is not the answer. It doesn't necessarily solve the problems it purports to solve. Most marriages are worth saving. I have not arrived at this conclusion based on religious or moralistic views. From my perspective, divorce is neither immoral nor bad. In fact, in extreme cases, certain relationships are better off terminated for the health and well being of everyone involved. This book will also address these exceptional situations. However, most people considering divorce do not fall into these extreme categories. For example, research shows the primary complaints leading to divorce are not physical abuse or addiction, but rather, lack of communication, lack of affection and nagging. (Hetherton, Cox, & Cox, 1981) I've grown increasingly convinced that most marriages are worth saving simply because most problems are solvable. Or more specifically, most unhappy marriages can be changed, and therefore, are worth changing. In fact, I don't believe in "saving marriages," I believe in divorcing the old marriage and beginning a new one-with the same partner. Believing that most problems are solvable is new for me. Although I never would have agreed with the therapist from my area who said that 90% of the marriages in his practice are Dead On Arrival, I did feel that many problems were insurmountable. I attributed therapeutic dead ends to dead marriages. "These people really don't want to change," I told myself, or "They aren't admitting they really want out," or "Their marriage is so pathological it can't be changed." These explanations freed me from responsibility for the lack of progress, but I never fully believed them. I knew instinctively there had to be a better way. I recognized that I needed new tools to help couples. Rather than thinking stubborn marital problems were the result of incorrigible spouses, I began to scrutinize my therapy approach. This traditional approach, which was based on the appealing but naive assumption that understanding and expressing feelings will clear up problems, simply did not work. The couples I saw in my practice expressed their feelings, even understood their feelings, and yet, their problems persisted. Nor did I find useful the idea that couples can free themselves of their problems by gaining insight into their childhood traumas. Psychoanalytic theory has contributed the notion that people experience problems because of unresolved childhood traumas. In theory, once the root of the problem can be identified and "worked through," the problem will disappear. While this approach works for some people, experience has taught me that insight of this sort simply takes too long for people in crisis. Couples on the brink of divorce require immediate evidence of "light at the end of the tunnel" to avoid an all-consuming pessimism which dissolves relationships. Another detour on the road to problem solving was my belief that couples need to understand how their upbringing influences their behavior and attitudes as marital partners. While this particular route was often interesting and sometimes informative, my clients would frequently plead, "Now I see that we are re-enacting our parent's marriages, but WHAT DO WE DO ABOUT IT? We can't stop fighting." I learned that having explanations for problems doesn't necessarily solve problems! Furthermore, when I looked around I noticed that there was precious little agreement among professionals; each therapy approach had a different way of explaining how problems develop. T.A. (Transactional Analysis) therapists told their clients, "You are coming out of your Child instead of your Adult." Gestalt therapists said, "You aren't in the here and now." Family therapists told their clients," Your son's behavior is a symptom of what is happening in the family. Behavior therapists altered reinforcement schedules. What was most confusing was that research failed to show any single explanation to be more valid or accurate than any other. "So, now what,?" I wondered. "If no single underlying cause can ever be defined, or if explanations fail to change anything, where does that leave me?" That left me at the doorstep of Solution-oriented Brief Therapy, an approach that emphasizes finding solutions rather than developing explanations for problems. Solution-oriented brief therapy (SBT) is a new dynamic, results-oriented therapy approach. The methods are based on radically different assumptions that enable couples to make sudden shifts that transform their relationships. In my practice, divorce is the exception, not the rule. Even in extreme cases like Ann's, couples who initially appear undisputedly divorce-bound often reverse their decision and remain in their marriages to work things out. As its name implies, brief therapy is short term, meaning that goals are usually accomplished in a limited number of sessions. Research indicates that the average length of treatment for practitioners of SBT is four to six sessions. Though brief therapy comes in many varieties, shapes and forms, (in fact, there is much disagreement, even among brief therapists, as to the definition of brief) all brief therapists seem to have at least one thing in common- a mind set of being task-oriented. Clients are asked to set goals early on so that progress can be closely monitored at each session. In contrast to long term therapy where change is expected to be a difficult and long-drawn-out process, if little or no progress has been made since the previous session in brief therapy, a new strategy is planned. How can brief therapy be so brief? In other words, how is it possible that goals can be achieved in such a short period of time? Chapter Three, which describes the theory and evolution of SBT in detail, offers several explanations for these results. However, one reason is that, as compared with psychoanalytical approaches, which begin the therapeutic journey with a trip to the past to uncover pertinent information about the nature and origin of the problem, brief therapists are more interested in the present and the future. By identifying each person's role in the way the problem is being handled today, brief therapists obtain the raw data necessary to generate prescriptions for change. By so doing, lengthy reviews of personal histories are by-passed. More importantly though, SBT therapists focus on the future, helping couples envision what their lives will be like without the problems. Unlike psychodynamic or psychoanalytic approaches that emphasize how problems develop, SBT asks the question, "What do you want to become," and "What are the necessary steps to get there?" Therapy becomes less explanation-oriented and more solution-oriented, a process which takes considerably less time. SBT's emphasis on finding solutions to marital problems rather than exploring the problem and developing explanations is based on a fairly simple formula; doing more of what works and less of what doesn't. Couples learn to identify what they do differently when they are getting along so that they can do more of it, and to identify unproductive patterns of interactions so that they can eliminate or do less of that. Once couples can see what they need to build on and what to eliminate, they have specific parameters to guide them. The most common complaint from clients who have had disappointing therapy experiences is, "We talked a lot about feelings but my therapist never gave me a clue about how to change my situation. It was really frustrating." SBT clients don't have this complaint since this approach emphasizes "Less talk and more action." People know what to do differently when they leave the session; they go home with a plan. At first, it appeared incredible that problems could be solved without an in-depth understanding of the problem; it seemed too simple. I struggled with this for a long time because it contradicted everything I had ever read or been taught about how people change. Most people, including most therapists, believe the change process has to be complicated and arduous. "No pain, no gain," is the general rule of thumb. I was having an impossible time explaining to myself why, in case after case, my clients reported significant changes after the first few sessions without exploring the past. Try as I might, the old theories about change simply did not apply. I needed to reorganize my thoughts to come to terms with what at first seemed like psychotherapeutic sleight-of-hand. Finally, in the midst of a golf lesson, an explanation became obvious to me. I had been terribly frustrated by the lack of progress in my golf game. Friends advised me to take a lesson from a golf pro. Ready to drop the game entirely, I agreed, thinking that the only thing that would cure my bad golfing habits was a major overhaul of my technique. Imagine, instead of just "fixing" my golf swing, my instructor espoused explanations about my problem. "You obviously have a fear of winning," he might have postulated, "Let's examine how you inherited your fear of success from your father." Or, "The reason you're playing poorly is to make your golf partner look good. First we must explore where you learned that you must take care of others in this way." These hypotheses, interesting though they may be, would have irritated me since what I really wanted was some concrete advice about swinging the club, not an explanation of what was preventing me from playing well. Luckily for me, the golf pro was not interested in developing theories about my ineptitude. I certainly had enough of my own. Instead, the instructor closely observed my golf swing. At one point, he held out his arm and asked me to squeeze it with the same strength that I gripped the club. I nearly stopped the flow of blood in his arm. Then, he asked me to extend my arm so that he could demonstrate the correct "relaxed" grip. I was amazed at the difference between our grasps, and thanked him for this "tid-bit" of information. The lesson continued without the major overhaul in my technique for which I had hoped. It wasn't until I got out on the course later that week that I realized how this seemingly small, seemingly insignificant "tid-bit" of information had radically transformed my game. My balls went further and straighter than ever before, cutting points off of my score. So much for small pointers. Anyone who has ever had a golf lesson can probably attest to the fact that slight changes in the golf swing can have profound effects on the golfer's overall game. Loosening one's grip on the club, placing one's feet further apart or allowing one's torso to turn with the momentum of the swing might drastically reduce one's score. The level of one's golf skills can be drastically altered by small shifts in the way the game is approached. Similarly, if you think about interactions in relationships as habits or repetitious patterns developed over the years, you can see how a minor change can make a major difference in the relationship. An unexpected peck on the cheek in the morning can have a ripple effect throughout the day, which in turn can engender good will throughout the week and so on. This has certainly been true of the couples in my practice. After observing case after case where people talked about how minor shifts in their behavior led to major changes in relationships in relatively short periods of time, and that these positive changes occurred without investigations into the causes of the problems, I gradually realized that change doesn't have to be as complicated or as enervating as I once thought. In fact, frequently, the best solutions are the simplest and the ones most easily overlooked. Follow-up research on brief therapy is encouraging. It suggests that brief therapy is at least as effective as long term therapy in terms of achieving lasting results. Given the cost and the time commitment involved with long term therapy, brief therapy is an appealing alternative. It provides answers to people who want to change their lives, not just understand their marital merry-go-rounds. My observations during this period of time reminded me that while psychoanalytic theory has made a major contribution and a tremendous impact on the western world, it is only a theory. Different theories provide different maps. Though road maps and relief maps are both useful at different times for different purposes, which one you require depends on what you are trying to accomplish. For the purpose of solving problems in marriages teetering on divorce, it may be time to look beyond psychoanalytic explanations of behavior. In fact, a growing number of therapists are doing just that. Once I recognized the effectiveness of SBT, I became a devoted teacher, traveling extensively to spread the word to my colleagues. The response over the years has been overwhelming in terms of the numbers of therapists interested in learning this new method and in regards to their favorable response. Thousands of professionals seeking to become more effective in their work have attended workshops and other training events and have felt energized by the innovative ideas presented. When one considers how SBT challenges mainstream psychotherapeutic thought, the enormous reception to this model has been somewhat surprising. While I have been extremely pleased about my impact in professional circles, it has become clear that my work has just begun in terms of "spreading the word." "Since SBT works, its practical, teachable and doable, why not make it available to the public?," I asked myself. Given that one out of every two marriages ends in divorce, I felt the urgency to translate the principles and procedures of SBT into everyday English for couples. This book was written with the hope that it will help many of its readers get more out their marriages rapidly so that considerations about divorce vanish. Perhaps you have been considering divorce. We all do from time to time. Few people are exempt from having this fantasy. Maybe your spouse is the one who wants out. Maybe you are someone who has thought about divorce for so long, you are ready to take action. Or, perhaps you have already seen an attorney or are separated. 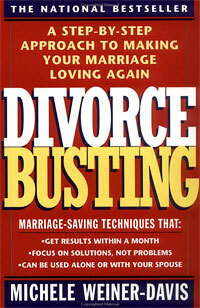 Why, if you are so convinced that divorce is inevitable, did you pick up this book? What appealed to you about the topic? It is not a coincidence you decided to read this - you are not ready to cut ties or let go. You are still hopeful that somehow, some way, something will happen so that you and your spouse will be loving and happy again. This hope, however small, can be the beginning of a new relationship. Don't get me wrong, I am not saying that if you passively sit around wishing and hoping things will get better, they will. They won't. You have to make changes, then the relationship will change. The purpose of this book is to tell you it is not too late to mend your broken marriage. If you have even the slightest interest in working things out, change is possible. Like Ann, even if you think you have tried everything, you probably haven't. I can't begin to tell you how many times I've heard,"I tried everything and nothing works," from people who quickly discover overlooked solutions. "But my spouse doesn't want to work on the relationship"
An all too common stumbling block to working out problems in marriage is the idea that both spouses need to commit to working on the relationship in order for the relationship to change. For example, prospective clients often ask, "My spouse won't come for therapy, so is there any point in my coming?" My answer is always, "Yes! Yes! Yes!" Relationships are such that if one person makes significant changes, the relationship must change. Too many marriages go down the drain because each spouse is waiting for the other to change first. The message throughout this book is clear-- change your marriage by changing yourself. The key is in discovering which particular behaviors to change since all changes are not created equal; some efforts are more cost-effective than others. With this in mind, this book will help you identify ways to get unstuck that can be implemented on your own. Problem-solving approaches which require both partners to participate in such things as experiential exercises are impractical. Even in the best of marriages, it is often difficult for couples to coordinate time together. So, (although it may be fun), you don't have to read this book together, you don't even have to conspicuously leave the book around the house hoping your spouse will notice the particularly relevant pages heavily highlighted by your magic marker. By changing yourself and how you respond to your spouse, you can change your marriage. I have seen it happen again and again and again. This book consists of two major sections, the "why to" and the "how to." The "why to" section offers a rationale for couples staying together and working things out. There are lots of good reasons for people to forego the temptation to leave the marriage in order to find peace of mind. This section outlines those reasons and describes the pitfalls of divorce. The "how to" section concretely describes marriage-enriching, divorce-preventing techniques based on brief therapy principles. Whether you are someone who is seriously considering divorce, or someone whose marriage is basically sound and want to keep it that way, this section will help you discover the short-cut to making marriages work. Generic marriage-saving advice like compromise, compassion and unquestioned commitment has no place in this book. Instead, you will find a step-by-step, nuts-and-bolts approach to getting unstuck and making your marriage loving again. Over the last few years I have lost count of the many people I've worked with who were just about to give up on their spouses, but turned things around instead. These individuals have taught me a great deal about the making of successful relationships. As you read about them, what they endured and how they changed, you will understand what David Ben-Gurion meant when he said, "Anyone who does not believe in miracles is not a realist." Copyright 2006. Michele Weiner-Davis. All rights reserved.